While spices provide a healthy zest of flavor to meals without adding unhealthy sugar or fat, they are pricey and a luxury not all can afford. Learning about spices has been a key part of Polack Food Bank cooking classes. Each month, Food Bank Specialist Brian Sindel meets with about a dozen clients to make a healthy, affordable meal that can be prepared with minimal cookware. Instead of using fat or sugar to flavor the food, the group turns up the spice. The goal is to learn healthy cooking and eating on a budget. You can help make healthier cooking more accessible for JFS clients. 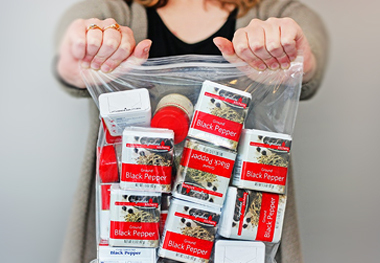 Organize your own spice drive and donate small bottles of spices in a one gallon-sized ziplock bag to the Food Bank. Please avoid glass containers and keep like spices together in one bag. Please keep spices organized by type, like the black pepper above. Your spice donations will help low-income people access ingredients that can improve health outcomes. And because clients choose spices that satisfy their personal tastes and cooking preferences, your contribution is another way to respect the dignity of people turning to JFS. Once you complete your spice drive, contact Volunteer Services at (206) 861-3155 to arrange drop-off and delivery.